Even though another (currently) popular title may have outpaced Grand Theft Auto 5 in terms of monthly user count, longevity and long-term success are what really matter in this business, and in that regard GTA 5 remains undefeated. After reporting time and again about new sales milestones being crushed, it is clear that Grand Theft Auto V is hugely successful – but even we didn’t think it would be this successful. MarketWatch reports that as of this year, GTA 5 has become the single highest earning piece of commercially sold media in the history of… well, media. Having earned over $6 billion in total revenue, the game is several times more financially successful than any film ever made – the highest grossing film of all time, Avatar, made $2.8 billion. While the games industry as a whole has been more profitable than the movie industry for years now, the general idea has always been that films are, by default, more mainstream than games. GTA 5, however, is known to have become about as mainstream as any property can. $6 billion is an absolutely colossal figure, and is significantly more money most of us can possibly visualize or imagine. 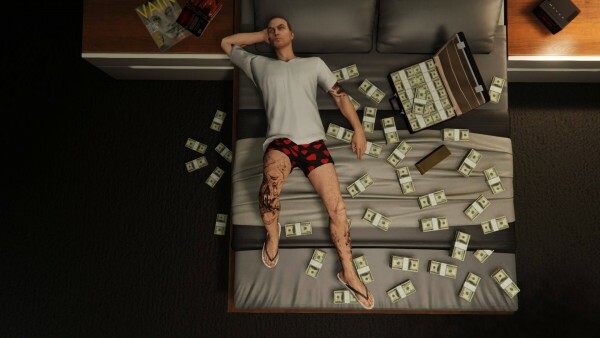 Since GTA 5’s budget was “just” $265 million, to say that is has been hugely profitable and an insanely good investment on Take-Two’s part would be the understatement of the century. It is hardly any secret at this point that GTA 5 is the best selling title in the franchise, since no other outcome would be possible after achieving the “best selling non-bundled game of all time” status. That said, it is a revelation that it alone sold more than all three 3D era games together. When people think “video game that sells like hotcakes”, the other franchise that pops into mind next to GTA is almost always going to be Call of Duty, however CoD doesn’t even hold a candle to Rockstar’s masterpiece. CoD sales have been going down in recent years, with the two best selling titles in the history of the franchise being a few years old themselves – Black Ops and Modern Warfare 3. That said, neither broke 30 million copies, whereas GTA 5 has happily zoomed past 90 million already and we’re likely soon to report on the 100 million mark being hit as well. While it’s never been a secret that PC sales don’t amount to a huge percentage of GTA 5’s player base, the report released by MarketWatch reveal just how small a segment the PC is when it comes to GTA 5. I’m personally quite surprised at the ratio, but then when we’re speaking 90 million copies, even that percentage translates to a lot of sales. Just 2.1% of GTA 5 copies sold in total were for the PC – granted, that number does not include digital sales, which are likely greater than physical. GTA 5’s success is likely a combination of marketing, brand recognition, snowball effect from initial popularity and a whole lot of luck. It’s probably going to be a long time until anyone else catches lightning in a bottle like this.